Wow, I can't believe the week (well, work week) is half way over! After being so inspired by all of you, I looked through my closet for something a little more girly to wear...perhaps a dress, skirt or even shoes that aren't boots. Alas, the weather won out again and I bundled up. Its just hard to dress cute when I have to bare the elements everywhere I go (my feet are my mode of transport). And now for fall nature fashion Wednesday. The pictures may not be super fall looking, but it is a cute little church. This church was completely surrounded by a graveyard. Not my thing, but interesting non the less. totally cute outfit. loving the vest. i love this outfit! the vest and the scarf are super cute! love the vest and scarf. you put it all together so nicely! And the church is awesome. I love that - this could be me on just a random day for shopping. I have such a scarf, too. the scarf is amazing with that vest, love how you combo'd it. Love the scarf and the vest. Great outfit! what a pretty church! And I love the scarf and vest combo! Ooooh, I never would have thought of the shirt/vest combo, but I LOVE it! this...this is fall-perfect. 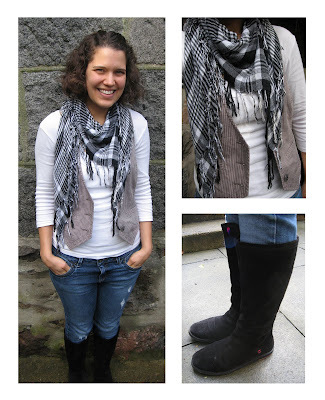 the vest, the scarf, the boots, i love it all! That vest is awesome and I love it paired with that scarf-- I would have never thought of that! PS-- Your hair is so cute too! VESTS! I forgot about vests. Now I want a vest so I can put it on and pretend I'm as cute as you! This outfit is my favorite yet! It is so simple yet very classy.